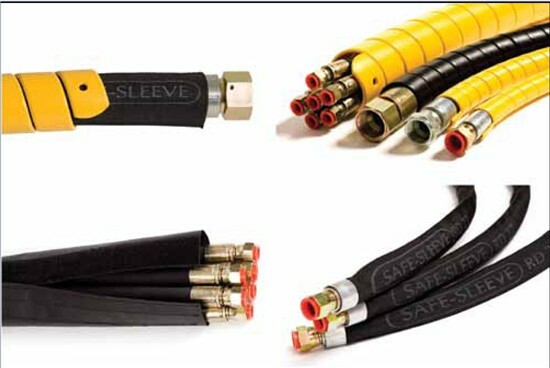 A range of products designed to secure and protect hoses as well as securing the safety of operators and other personnel in the proximity of working machinery. The Safeplast range of products falls into four basic groups. Also available is Safeplast Binding Spiral developed to protect electric cables and wires from stress caused by abrasion and shocks and to make the installation and maintenance of electrical cables easier. This product is designed to cover hose assemblies to protect personnel in close proximity, against the consequences of an operational failure. Available in a standard version and also in an MSHA (mining) approved version. They both have excellent pressure resistance are abrasion resistant and work within wide temperature ranges. This is used to bundle groups of hoses together and is produced from 100 % polyamide 6.6 with PU coating and Velcro® -brand fasteners which make it very easy to install on hose lines after assembly/installation and repeatedly when required. Its tensile strength is excellent (EN ISO 13934-1) and water repellence of the fabric is 100% (EN 24920). Is also used to bundle hose lines again and again. With or without fixing/mounting eyelet.